We urge everyone who finds or knows about other products in the Church Presentation Software space, that are not in our list, to add a comment with a link to the product(s) website and optionally a short review/recommendation. We will strive to add the missing entries as they are discovered. Also, if any of the listed products get significant updates, a change in their pricing model, or are discontinued, please let us know and we will update the details. A big thanks to all of you who help us keep this list updated! The Complete List of Church Presentation Software for 2019! At a minimum, each product will have information about its main features, price and home page. We will strive to keep these details correct and updated. Let us know in the comment section if you find any mistakes. We will also try to include at least one unique or different thing that sets the product apart from the others. While not specifically tailored for it, SlideDog is used by more than a hundred Pastors and Church AV technicians for handling sermons and church services in the USA today. It offers great PowerPoint and media files compatibility, has an iOS/Android and web based remote, includes audience interaction features and is apparently a good enough church presentation software alternative for many people. SlideDog does not come with Bible or SongSelect integration, so content creators would have to add that to PowerPoint slides, videos or images themselves. Download SlideDog for free and give it a try! An impressive and well maintained open source project with PowerPoint/LibreOffice Impress and VLC (open source media player) integration. Features a web remote and dedicated Android/iOS remote control apps. Comprehensive user manual and advanced support of network connected stage monitors. Supports bible and song import from a number of formats and sources. Available for Mac, Windows and Linux. Free and well maintained open source projection software for churches with a variety of import options, meaning you can easily migrate your existing content to Quela from other software such as EasyWorship, OpenLP and OpenSong. Multilingual user interface offering out of the box support for a separate stage/presenter view. Offers video background support in addition to static colors and images. Comprehensive manual and good support for setting up projectors. Available for Mac, Windows and Linux. Free church presentation software with a seemingly focus on song lyrics, but with lots more to offer once you look under the hood. It has Bible, PowerPoint and video support. It includes a browser based remote control, integration with OBS Studio for live streaming and offers the possibility to store your service in the cloud via DropBox, Google Drive or similar cloud storage provider. It’s available for Windows 7 and up and has an active community forum. They offer video tutorials on their website. Free church presentation software with a vast amount of features. Highly customizable MS Office inspired user interface with support for displaying Bibles, song lyrics, PowerPoint presentations, PDFs, picture slideshows, videos, and image galleries. Allows for displaying of music chords over lyrics. Its blog has tips on how to sync songs between multiple computers using Dropbox and how to add and use video loops. Available for Windows. Has a YouTube channel with fairly new and well produced getting-started videos. Well maintained open source software application that focuses on management of lyrics, chords, lead sheets, bible verses and scriptures. Supports timed loops of slides with text and images. Allows you to keep track of a song’s title, author, copyright, ccli #, tempo, time signature, theme, focus, capo position, user defined fields, and more. Available for Microsoft Windows, Mac OS X, and Linux operating systems and translated into several European languages. Has a dedicated companion desktop application for song importing from various formats. As the name indicates, this is a Bible and scripture focused church presentation software. It describes itself as “a software solution for presenting Holy Scripture verses on any video display device connected to a personal computer running Microsoft Windows”. Comes with support for many bibles in many languages and allows for much customization of themes, backgrounds, fonts and more. Supports NDI (Network Device Interface) video monitors. Has a list of useful keyboard shortcuts and tries to set itself apart from others by offering to display any scripture using at most 3-4 mouse clicks. It also boasts being able to show 4 synchronized Bible verses on the same screen. EasySlides (formerly EasiSlides) is designed for projecting lyrics and Bible texts with a video projector. It has some multimedia support in that it allows you to play audio and video files in the background, along with the lyrics. You can also attach a live feed from a camcorder or use static or animated image backgrounds. It has a built in praise book generator, supports three-monitor output and allows you to set up alerts and notifications. The current version, v.4.0.5 is available for Windows only. They have a users forum, but it’s not very active. Development of version 5 has been in the beta phase since 2017. This open source software focuses on editing and displaying song lyrics and passages of text along with images and videos on a second screen/projector. With Lyricue you are not restricted to setting everything up before the event as you can add, remove and change songs on the fly. You can type up notes directly to the screen or quickly display a bible verse at an instants notice. It is a networked software in its nature and requires you to set up a server on a Linux box. Hence it must be controlled by a web interface (called Precue) on the server computer or another remote device. The user interface is translated to English, Spanish, German, French, Dutch, Brazilian Portuguese and Swedish. The project has been running for quite some years and slowly but steadily releases new updates. It’s Linux only, uses a client-server architecture and requires a bit of technical insight to get up and running. Mediashout is a feature rich church presentation software solution and comes with all the bells and whistles you’d expect from a market leader in this space. It is available for both Mac OS and Windows and the user interface has a lot of options for customization, such as layout setup, light/dark theme and interface language (French and Spanish, in addition to English, is supported). A nice feature, if you have volunteers running the show, is that you can enable “Voulenteer Mode”, which offers a simpler interface mode, hiding the settings and edit content controls. Mediashout offers an iOS app (why no Android app?) for remote control in addition to supporting USB wireless remotes. It has built in integration support for Dropbox (file sharing), Planning center (worship planning tool) and SongSelect (song database) and offers some additional tools for printing and reporting. The documentation on their website is good, with comprehensive articles and videos, and they even have a dedicated knowledge base app for iOS and Android that can help you out with common technical issues. Proclaim is a major player in the church presentation software space. Their license model is subscription based and unlike others they will allow you to create an unlimited number of team accounts and install the software on as many Mac or Windows PCs as you want. This also means your team can edit and run several concurrent presentations using the same license. Proclaim integrates with the usual providers (SongSelect, Planning Center, Logis Bible Software and more) and any changes made to your service is saved to your teams cloud account. Their (and their partner) media library contains over 16 000 motions, stills and mini-movies, but you have to pay an extra fee to get access. Proclaim have implemented Polls & Surveys in their software, making it easier to interact and engage with your congregation. They have their own Proclaim Remote App for iOS and Android that works over local WiFi (no Internet connection required). Proclaim is probably the most complete church presentation tool out there. It has features and functionality that moves beyond the Sunday worship service, such as Digital Signage, Slide Sharing and Sermon Recording and Publishing. ProPresenter is a cross-platform (Mac and Windows) worship and presentation software for live events. It not only targets worship gatherings, but also sporting events, conferences and trade shows. It has advanced video editing features that allows you to crop and zoom videos dynamically from right within the software. As for slides, ProPresenter offer “A multi-layered architecture allows for backgrounds, live video layers, slides, props, and masks to be controlled independently”. In addition to these multimedia features, the software can be extended with Audio Visual modules (hardware and software products) to further extend its capabilities. As for Worship-specific features, ProPresenter supports Planning Center integration, has a scripture engine which gives access to Bible translations in a variety of langues, lets you import lyrics from SongSelect and has a built in Media Store that lets you add media from their partner media library (Worship House Media). The user interface is multi-lingual and also comes with an iOS/Android remote. It has cloud integration for saving and sharing content and a built in twitter wall feature, allowing you to curate and display Twitter posts. EasyWorship focuses on being powerful, yet simple worship presentation software. Their user interface is clean and easy with intuitive tabs for selecting Songs, Scriptures, Media, Presentations and Themes. You can select between a light and a dark theme, but their interface is in English only. It doesn’t have all the features that MediaShout or Faithlife Proclaim can offer, but contains the essentials like slide design, alerts, remote app, bible search and a media search engine powered by Skit Guys, Centerline New Media, Hyper Pixels Media and others. They have a flexible licensing solution, letting you choose between subscription and one time fee. For broadcasting, EasyWorship supports Alpha Channel, NewTek Tricaster AirSend and Blackmagic, along with NewTek NDI. EasyWorship is Windows only software. Price: $180 USD annually or $399 USD one time fee. Zion Works is a worship presentation software product for Windows designed for a dual screen setup. The user interface is simple and lets you display Songs, Media, Bible scripture and PowerPoint slides on a secondary monitor while controlling the flow from the main monitor. You create playlists of these components, which you can package and transfer to another computer. It integrates with the bibles of the BibleGateway website and you can import songs and CCLI formtatted files. As with many other worship software you can also instantly display popup alerts and notifications. Unlike most other church presentation software products, Sharefaith Presenter isn’t a stand-alone application, it’s a PowerPoint Plugin. In their own words: “Sharefaith Presenter is not for every church. It’s custom built for the small-to-medium size church that works on a PC, has multiple campuses, and/or still believes that PowerPoint is of great use within the church.” Sharefaith Presenter requires Windows 10 and the version of PowerPoint that comes with Office 365 (2016/2019). It has a built in worship graphics library that gives you access to 90,000 media items inside PowerPoint (templates, videos, backgrounds, etc.). You also get access to SongSelect by CCLI directly from the plugin inside PowerPoint. They have a subscription based license model. The higher price tiers include more media and some additional features. Big Screen is, unlike most others, a web based church presentation solution. That means you don’t have to install any software and you can run it on both Mac OS and Windows using a modern browser like Google Chrome or Mozilla FireFox. The downside to this is that an Internet connection is required. Big Screen is split into two sections; the admin section and the control surface. The control surface is the interface to present your media. You can add Songs, Videos, Images, Timers and Bible Scriptures to playlists and save them in your online library. When presenting, multiple new browser windows will be created for each of the screens connected to your computer. You will then have to drag the window to the correct screen. 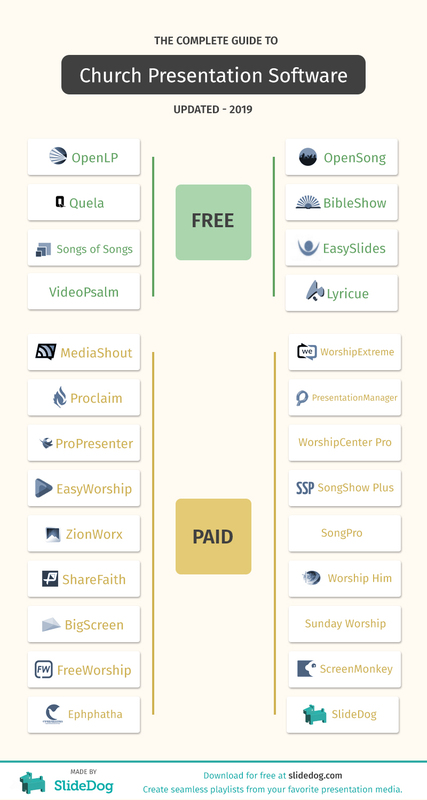 FreeWorship, as its name states, is free, but comes in a more feature-rich paid Pro version. As it’s not completely free (but instead “Freemium”), we felt it was better to add it to the paid category of this post. The biggest differences between the Free and Pro versions is that the latter includes licensed bibles, comes with SongSelect integration and features Website Projection, Live Twitter Feed and Google Slides support. You also have some other differences that you can compare in the Pro vs. Free comparison table on their website. Both the Free and Pro versions support PowerPoint slides and can play videos, songs, images and bible scriptures. FreeWorship is compatible with Windows Vista and above. The user interface is similar to other Worship software, consisting of a playlist of media items, controls for launching and adding new items and “Preview/Up Next” and “Live” viewer panels. Price: Freemium. Pro version is USD $100 one time fee. Worship Extreme is a modern looking worship software product for Mac OS and Windows. It features song lyrics and slide editors as well as Google Slides integration. The software you install on your computer works in combination with the Worship Extreme cloud server, where all your media and playlists are stored in your personal Worship Extreme Media Library. PowerPoint isn’t supported natively, but you can import slide decks, which will then automatically be converted into a suitable format for Worship Extreme. The software lets you import lyrics from SongSelect, OpenLP, MediaShout and EasyWorship. Both Free and Paid bible formats can be imported. Worship Extreme also features a Remote App and a Stage Display app, both available for iOS and Android. Other features that deserves to be mentioned are: congregation/audience polls, alerts, countdown timers and their LiveSwap integration. Presentation Manager is a Windows and Mac Worship Projection Software solution that comes with a built in media database of over 500 songs, over 500 images and over 100 videos included. The user interface looks a bit dated, but comes with the essential controls for displaying videos, images, songs and scriptures. Presentation Manager supports displaying PowerPoint natively and has built in editors for songs and image/graphic backgrounds. You can create sermon notes and view these while giving the presentation, setup looping announcement slides and toggle nursery alerts for displaying numbers, sets of numbers, or messages during worship. WorshipCenter Pro features a built-in scripture database and support for PowerPoint, video files, images, Flash presentations and web pages. WorshipCenter Pro includes over 4,000 hymns and also includes an interface to CCLI SongSelect to import contemporary praise songs. The Full King James Version of the Bible is included and you can automatically create slides for whatever verse you need. It can play videos and supports AVI, MPEG, ASF, Windows Media, RealVideo, QuickTime and Flash. The PowerPoint support seems to be limited to PowerPoint 2000/XP/2003, indicating that this software hasn’t been updated for a while..
SongShow Plus is a fully featured worship presentation software solution. It displays songs, scripture, images, video, web pages (including YouTube & Vimeo) and allows for importing of PowerPoint slides. It has built in editors with tools for colorization, hue adjustments, blurs, hinges, reflections, image masking, overlay and more. You can sync your content to your cloud account at Dropbox, Google Drive or Microsoft OneDrive. Contentwise, SongShow directly integrates with Shift Worship where you can find over 3000 pre-produced mini-movies, motion and still backgrounds for worship environments. SongShow Plus also includes integration with Planning Center and they have their own app on Google Play for remote controlling the Windows application. SongPro isn’t only for songs, but (according to their web page) designed to handle all the requirements for services. Their software includes support for displaying songs (of course), hymns, Bible passages, liturgical text, PowerPoints, audio, video, Web pages, YouTube clips and notices. It is a Windows only software solution and comes with more than 3000 songs and over 300 background images and videos. SongPro supports syncing to Dropbox, Google Drive and Microsoft OneDrive. It has some advanced video and graphic features such as using live camera feeds as your motion background for songs and liturgy. Worship Him comes in a Lite and Power edition with the major difference being the Lite edition only supporting one projector feed, while the Power edition supports up to five. Worship Him is a feature rich application that supports all the media that you would expect, including PowerPoint and Impress slide decks. It has 13 included Bible versions and a large selection of video backgrounds, stills, hymns and graphics included. It supports Windows Vista and up. You can try it by downloading the free trial version of Worship Him, which is fully functional but only includes a sample of the graphics and Bible versions. Their license is Site based, meaning that customers may install Worship Him on as many computers as they want providing that it is for their use only. They don’t have any iOS or Android app, but instead offer a network remote control mode inside the application that let’s you control up to 3 other computers running Worship Him. Sunday Worship is “Church Song Presentation Software” that allows you to project songs, scriptures, photos, videos and notices for all the congregation to see. It is not as advanced as many of their competitors in this list and only offer basic features for song, Bible and video display. Its user interface is straight forward, minimalist and without any clutter, and might be just good enough for many users. Their software isn’t updated frequently, but with a relatively simple feature set that’s not necessarily a bad thing. Screen Monkey is professional media playback and control software for Live Events, Theatre, Churches, VJ’s and Broadcast. They have a separate software package called Worship Monkey that is intended for use by churches who want to use Screen Monkey for displaying their song words. It provides a simple interface to search for songs and build a service plan that can then be imported into Screen Monkey. To use the Open Song library in Screen Monkey you must download a separate converter tool from their web page. Ephphatha (I have no idea how to pronounce that) is a church presentation software tool made in India. Their web page isn’t very clear on what features that are included or how much the software costs, but looking at the screenshot from the application, it is definitely a Windows application. It also seems from the screenshot that they support creating playlists of Bible scriptures, hymns, prayers, liturgy and media, including PowerPoint and audio/video files. You can request a demo on their site and there’s also a phone number you can all to get more information. This section is dedicated to software that have stated their discontinuation or that simply haven’t been updated in many years and are apparently dead. Praisenter is an application that provides display of Bible verses, songs, and notifications (among other things) to a secondary display, typically a projector, monitor or television for use in a church service or event. Praisenter allows display of verses from numerous bible translations (provided by The Unbound Bible) with standard graphics for each verse. It’s available for Windows, Mac and Ubuntu Linux. Unfortunately the project seems dead as its source code repository on GitHub hasn’t been updated in many years. The last entry of the News section of its website was in January 2014. PowerWorship enables you to create and maintain a library of worship songs and can be used to build presentation slides for Microsoft PowerPoint and Apache OpenOffice. It comes in Free, Standard and Premium versions. The software seems simple and intuitive, but isn’t maintained anymore. On August 8th, 2018 the author tweeted: “Looking for a company or qualified individual to take over future development and support.”. LiveWorship by GeekJam, LLC is a Mac/Windows cross platform worship solution. It features a drag and drop interface and allows you to display Bible scriptures, songs, audio, video and image backgrounds. They offer a 30 day trial that you can download directly from their web page. The last update on their “What’s New” page was in May, 2011 and their “contact us” link doesn’t work anymore. Their Twitter and Facebook accounts also haven’t been updated since 2011. This is most likely a dead project. ShowShare is a web based presentation software for Christian worship. It doesn’t require any installation and should work on any web enabled device or platform. It’s made by Delta Lights, which appears to be an AV supplier offering technical services and training. Both the company web page and the ShowShare product page haven’t been updated in quite a while and the user interface doesn’t seem to play well with modern browsers, which should be a minimum requirement if you offer a web based tool..